“Racing cross country can help you become a better runner on any surface by pushing against your limiting factors: It is enormously effective in developing strength, skill, stamina, and psychology – mental toughness and stickability are improved, too. And that will help you on the roads or the track much more than you might imagine.” – Julian Goater, The Art of Running Faster. There are a lot of races open to Bournville Harriers members and below you will find a summary of all the regular XC races which start in October and run through until February. All these races are open to members and the team managers will be in touch prior to races to ascertain entries. It should be noted that there is an entry fee for all the races (except the League races), which the club currently covers as part of your membership. Please be aware of this when signing up to a race because we are unable to cancel/reclaim any entry fees, injuries and illness cannot be helped, but we expect those who sign up to be genuinely intending to run. Birmingham And District Invitational Cross County League (Men) & Midlands Women’s Cross Country League (Women) – The men’s race is approx. 10km and starts at 2:30pm and the women’s race is approx. 6km and starts at 1:30pm. The two leagues are held by separate organisations, which means that the races aren’t always held at the same venue. Both the men’s and women’s leagues work in a similar way. The position of the first four female/six male finishers are added up to give the score for the team. All the scores from the races are added together and the teams are ranked in the league, which is separated across a number of divisions. We strongly encourage club members to take part in the league races. They are a fantastic club event, great team spirit and often well attended by our club members. Bournville Harriers often has over 30 runners in these events. Midland Country Athletic Association (MCAA) Midland Relays – The course is 6km long for both men and women and the men run four legs and the women run three legs. There are two age categories, seniors and masters where the male masters are 40+ and the female masters are 35+. This tends to be the first XC race of the year and with it being a shorter 6km, often in fairer weather and over a relatively easy going course means that we often get a good turnout for this event; it’s a nice starter for those who want to try XC. This event carries a £6 entry fee per runner, which the club will cover but please bear this in mind when signing up. British Masters Relays – Age 35 and upwards – Age category based relays over a 3km course. Categories are V35, V45, V55 & V65. This race is the shortest of all the XC races at just 3km – less than two miles. Long Eaton is quite a long way to travel for such a short race but the men won the gold medal for the V35 category in 2013. English Cross Country Association (ECCA) National Relays – The course is 3km for women and 5km for men. The women run three legs and the men four. The course goes through some woodland and it’s interesting but relatively straightforward. This is a national event and there are some pretty fast runners around – but embrace racing among some of the best runners in the country, enjoy the retail opportunities afterwards, and we’ll have a great time! 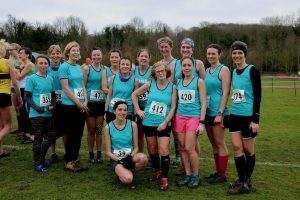 MCAA Midlands 5&7 Championship – Does what it says on the tin – 5 miles for women and 7 for men. The course is described as ‘undulating parkland’ but has been known to include a ditch and water feature and some fairly steep ‘undulations’! A cafe is available in the golf pavilion for post race refreshments and again it’s an event where we have had some success and podium finishes in the past! 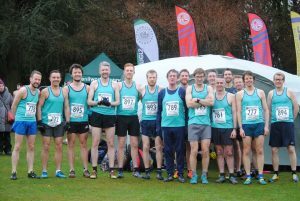 County Cross Country Championship (Warwickshire/Worcestershire) – This is a joint event for Warwickshire and Worcestershire Athletic Associations, but you only race against your own county. Numbers look subtly different so you can assess whether it is worth chasing someone down in the final stretch (the answer is always yes though). It is usually around 6km for women and 10km for men. It is a similar system to the league races where the first x runners score for the team, but everyone who runs can help our position in the ranking. Midlands Cross Country Championship – The distance is typically around 5 miles for the women and 7 for the men. It is similar to the county championships for scoring and format. ECCA National Cross Country Championship – The season finale! This is a fantastic outing and open to all. Some of the fastest people in the country will be there – and they are very fast indeed – but it is an absolutely inclusive event. The course is 8km for women and 12km for men. Again, the first four from the women’s team and six from the men’s team count for the club, but everyone who runs can improve our position by pushing others down the order! We usually organise a coach to take us and any supporters there and back. Q: I am unlikely to finish in the top finishers, is it worth coming? If you examine these results, then you can see that our first six runners finished ahead of the first RSC runner, this means we added 6 points to the RSC score. Our first seven runners finished ahead of RSC’s second and third runners, so we added another 14 points to their score. Finally, eight of our nine finished ahead of RSC’s fourth runner, adding a further 8 points. If you combine this then our club alone added 28 points to RSC’s score for that race. To give perspective, in the next race RSC scored just 22 points for their first four runners! RSC scored more points in that second race then all the other three combined. The Bournville Women came third in division 2 that season, winning bronze medals. If BvH (along with other clubs) hadn’t had the strength in depth then RSC would have likely scored much better and may well have been a strong challenger for that bronze medal. Q: What distance are the races? A: The women’s races are around 4-5 miles typically, apart from the national relays which are a mere 3km! The men’s races vary between 5 and 8 miles. Q: What do I need to run? A: Spikes are helpful for some races but trail shoes will generally be fine. You can buy spikes from most running shops or online, or there are often stalls selling them at the midland and national road/XC relays. You will also need a club vest or t-shirt to run in (this is important as we have to wear club colours) – and safety pins. We recommend also bringing a spare pair of socks, shoes that can get muddy, lots of warm clothes and a hot drink! Q: How do we get to the races? A: We encourage lift sharing and public transport, for the sake of the environment, our wallets and to ease pressure on parking at the venues. A: We usually have a tent with us to keep our kit dry when not running. Races will go ahead except in the most extreme weather conditions. A: For you, it’s free! The club pays the entry fee and league affiliation fees.